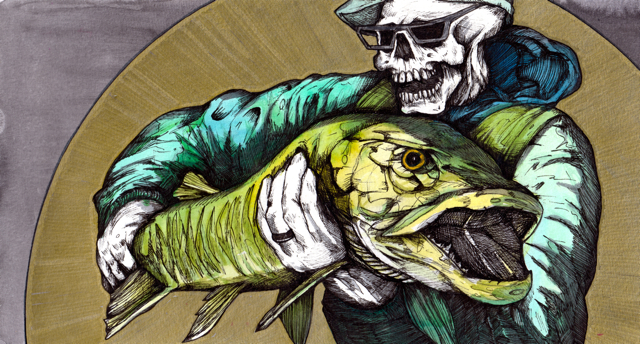 The second finished piece in the Necromancer series goes out to Pile Cast – a wicked cool fly fishing blog by a wicked cool guy. I’ve received a good deal of support from him, so in a way, this drawing is a way to say “thanks”. At large, there is an underlying theme to the Necromancer series developing; I could pick any subject, personal or unknown, to base these images on. So far, I’ve chosen to pick people/subjects that have had an influence on my life as a fly fisherman. I think that personal connection helps drive these pieces, it helps generate motivation and inspiration. I also pick scenes that say “Heavy Metal” while they say “Fly Fishing” – I mean, why the hell would I draw anything else right?